Another Kenxinda X series that got released in the month of November is the Kenxinda X9. As we can see, Kenxinda are beginning to take the smartphone line of business very serious. The Kenxinda X9 is the upgrade of the Kenxinda X7 that joins the Kenxinda line up of entry level devices that might just as well attract more smartphone lovers. 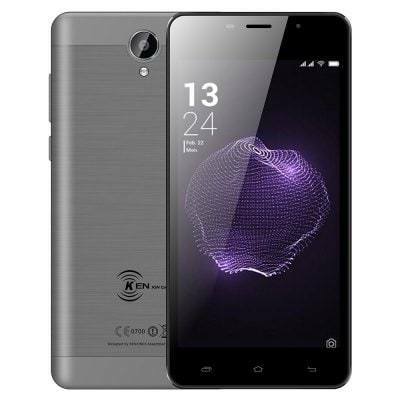 The Kenxinda X9 is a big and durable Android smartphone that supports the 4G LTE connectivity. Yes, as regards durability, the battery life of the smartphone is a toaster. Stay with me as this big and durable Kenxinda X9 Android 4G smartphone is reviewed. The plastic wrapped rectangular shaped design with curved edges comprises of a smooth well furnished rear and a brilliant screen display. Its rear consists of the primary camera, dual-LED flash as well as the KENXINDA logo at the base. The dedicated keys on the smartphone appear on the right side of the smartphone. The dedicated keys are the power button and volume keys. AT the frontal, the top bezel has the front camera, light sensor and earpiece as its occupants while the base bezel has the soft Android navigation buttons. The smartphone weighs 210 g but is slim with its 10 mm thickness. The other dimensions on the smartphone include : 154 mm length and 75.7 mm breadth. This big smartphone has a 5.5 inches HD display with an IPS LCD capacitive touchscreen. Its screen resolution is 480 x 854 pixels with a pixel density of 178 ppi. The display area has a screen-to-body ratio of 71.72%. Protecting the screen from shattering if it drops from high falls is the Dragontrail glass. Multi-touch input is supported on the smartphone’s display. Powered by a Quad core ARM Cortex-A7 CPU that clocks at 1.3GHz, Kenxinda X9 makes use of the Spreadtrum SC8932 as its system-on-chip. The 32-bit processor employs the 28nm process technology in its build-up. Heralding the graphics on the smartphone is the ARM Mali-T400 MP2 with two cores. The smartphone runs on the Android v7.0 Nougat OS out of box. The RAM on the smartphone is of the LPDDR3 type and has a 2GB capacity to handle multi-tasking. The storage of files on the smartphone is taken care of by a 16GB ROM. The smartphone’s storage can be extended to 32GB with the adoption of a micro SD card. At the fore, a 5MP snapper is responsible for taking selfies while at the rear an 8MP shooter captures the images. The rear has a dual-LED flash support for image brightening role. 2G GSM, 3G WCDMA and 4G LTE are all present for cellular connectivity purposes. The smartphone uses a long lasting 5,000 mAh battery as its powerhouse. The non-removable Lithium Ion battery doesn’t have the luxury of super speed charging as the smartphone lacks the fast charging technology. Kenxinda X9 has the $110 price tag. What is The Current Kenxinda X9 Price and Availability Status? You can click on the links below to view latest Kenxinda X9 price & availability.